Earn $2.87 in Rewards credit (287 points) What's This? 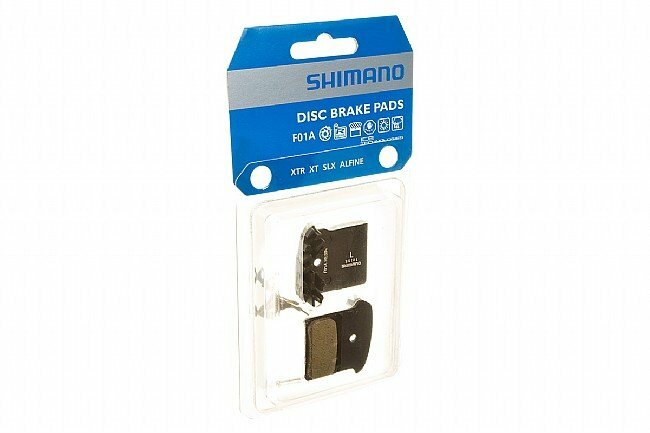 Shimano's F01A pads fit Shimano XTR, XT and SLX Disc brakes, featuring a resin pad compound for weight savings and modulation, along with special aluminum fins for heat dissipation under heavy braking. The F01A Resin Disc Pads are compatible with XTR BR-M985, XT BR-M785, and SLX BR-M666 calipers. Each set includes two pads and a spring, enough to retrofit one caliper. Not much to say except these are the exact drop in replacement for the pad on my Shimano Ultegra Di2 Hydraulic Road brakes. I removed the old pads, cleaned the pistons and brakes, put the new ones in, and the bike is good to go again. Previously order these online from another place but ended up with the wrong model pads, so got them from Wester Bikeworks since I figure they would know their stuff, and send me the right ones ... And they did. Works well and does not make as much noise in rain as non- resin pads. I have not made official test, but they seem to stop my bike faster than rim brakes. I highly recommend the resin pads. Arrived quickly and exactly as described. Perfect! Pricing was competitive relative to LBS and now I have new brakes. No fuss no muss.